The two innovators behind the Jetman Dubai jetpack athlete team recently released a video of them streaking in synchronized flight over the Dubai skyline and surrounding desert—and it brings a completely new perspective to the architecture of the city. Yves Rossy, a professional pilot from Switzerland, and Vince Reffet, a professional skydiver, have spent years perfecting the contraptions for propelled human flight. 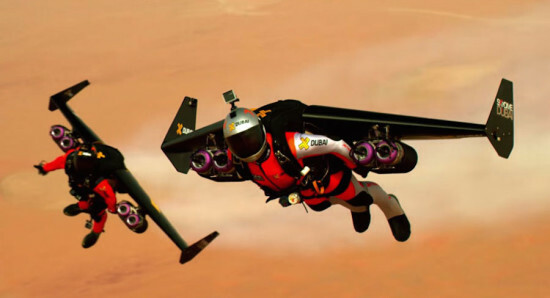 Although incapable of independent take-off, their delta-winged, turbine-powered jetpack can gain altitude when dropped from an aircraft and sustain flight for 6–13 minutes at speeds of 112–186 mph. 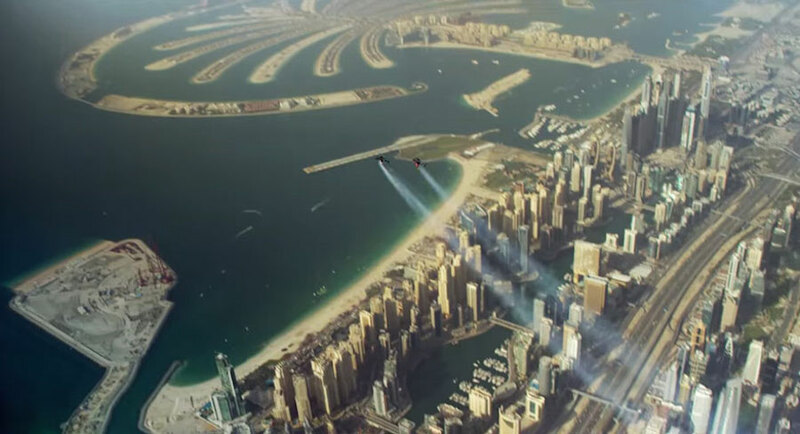 In the promotional video for Skydive Dubai, the duo are shown careening close to the Burj Khalifa, the world’s tallest building, shooting over the Persian Gulf coast, and freewheeling over the desert. “I felt I was flying. 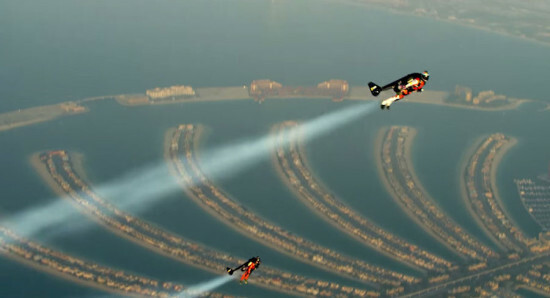 It is just an insane feeling,” one of the jetmen said in the video. “The moment when the action is coming there is big concentration. 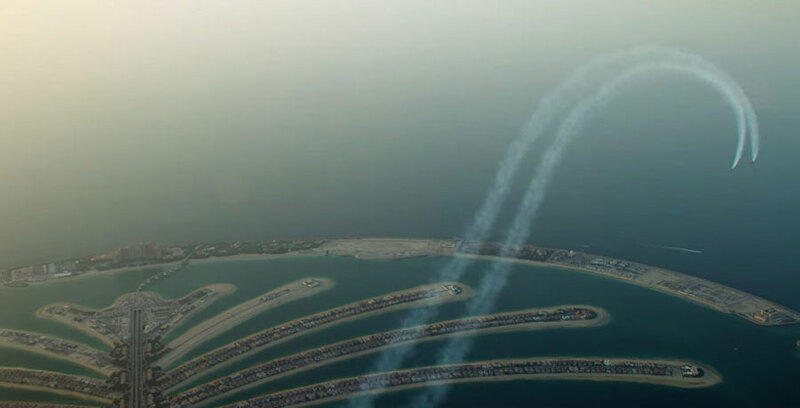 It’s a mixture of fear and adrenaline that we transform into good energy, into power.” The flight was shot from a chase plane and two GoPro cameras attached to the jetmen, according to The Verge. Rossy, infatuated with the world of free fall and an innovator in the world of propelled human flight, has tinkered for ten years with a jetpack that would allow for prolonged flight and better control of trajectory. With each new iteration, Rossy shrank the wings to make them more aerodynamic for faster flight, building on his first flightsuit that enabled him to stay airborne for just 10 minutes. Rossy is currently developing a new flightsuit featuring bigger and lighter wings with a slower approach speed for independent takeoff and landing, so that the flyer’s own legs can be used as landing gear. In 2013, Rossy cruised in the air alongside a B17 bomber jet at Oshkosh’s AirVenture airshow in Wisconsin. Rossy has also annexed the skies above the Swiss Alps, the English channel, and the Grand Canyon.